1. Ideas for finishing them for parasols. Paint the umbrella with pearl paint in a matching color to the umbrella. Pearl paint lets the color come through. Trim with lace, tiny colored beads. 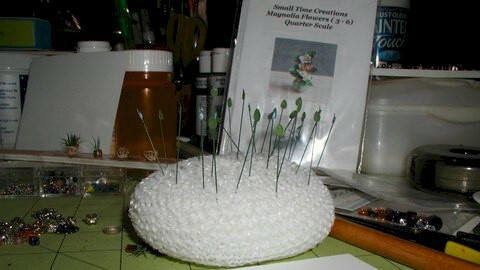 Cut the toothpick to length then put a larger bead at the end. 2. Finishing them for a sand box. Paint any color you like. Let the designs show through or cover them up. Seal. Stick the toothpick into the sand for a nice cover. 3. Finish them for outside table of cafe tables. Add thin tape scalloped around the edges. Paint them any color you like.Seal with several layers of acrylic sealer to make them look like plastic, or cover with thin plastic looking fabric. Drill a hole in in the center of your table then insert toothpick into the the center of the table. Please read the directions through so that you will understand what you are doing. 1. Paint the area you want to brick with a flat hobby paint of your choice. This color will be the color of your mortar between the bricks. 2. 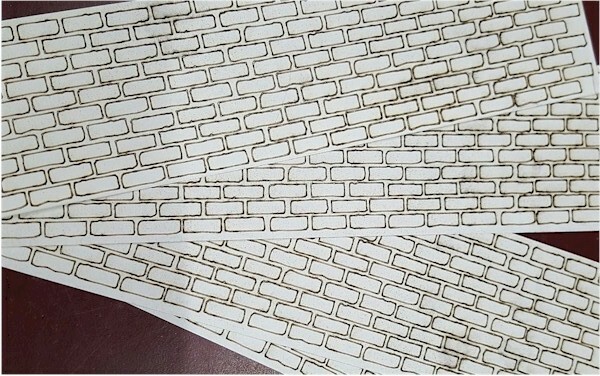 Leaving 1/4 to 1/2 inch at the end, peel the brick tape lattice stencil from the backing, and place it at the bottom of your brick project. You will need that 1/4 to 1/2 inch to grab to pull the stencil back off later one so don't forget to leave it sticking out at the end. We recommend that you only do one side of the project at a time. If the project is taller than the brick tape, peel a second strip and carefully place the first mortar row over the top row of the last piece of brick table so that there is only one line of mortar between tapes. Be sure that your bricks are staggered so that you don't have any vertical brick mortar in lines. The vertical rows should be staggered. Continue on until you reach the top of your project. 4. When that side of the project is covered with brick mixture, starting at the top, grab the 1/4 to 1/2 inch you left at the end, and peel the lattice stencil off one layer at a time. The brick mixture should have set up some but NOT be completely dry. Once you have all the lattice stencil off, let the brick dry completely. However you can start another side of your project. Be careful at the corners to make sure that your bricks line up to give a proper looking corner and make sure that you continue the staggered brick patter to the next side of your project. 5. Once the brick is completely dry, you can dry brush paint on some of the bricks to give the effect of different color of bricks, or shading for new/used brick. If you paint, let the paint dry completely. 6. Once the brick looks like you want it to, and the paint and brick are completely dry, spray the brick with a good acrylic sealer. Your brick will give you years of beautiful Bricks. Brick Mixtures: Magic Brik Mixture. I've arranged to buy just the brick mixture from Magic Brik. It comes in a 6 ounce package and covers 1 square foot. 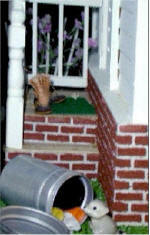 To use the brick mixture you mix small amounts with water. Only mix what you think you can use in a few minutes. I've found that empty small butter tubs with lids make great containers to mix the Magic Brik in because it will not harden immediately if you have extra and keep it covered. You mix just a few drops of water at a time. The mixture should be similar to the consistency of cake icing. You want it to spread but not drip. Magic Brik comes in red or white. If you use white, you can add a small amount of paint to have different color base bricks. Then you can add shading in other colors after the bricks are dry. Alternately, you can use ready mixed Joint Compound or Spackle. They come in small containers that cost about $4-$6 and are available at Lowes, Home Depot or any paint or hardware store. They basically work the same way. They come ready mixed and are easy to spread and wash up with water. On variation is if you want a more sanded product like the Magic Brik, you can place a small amount of the joint compound or spackle into an empty butter container, and mix about a teaspoon of very fine play sand into the joint compound or spackle. You may need to add a few drops of water to bring the mixture back to a good spreading consistency. Since these products are white or off white, you can add small amounts of paint to color your brick before you apply it to the lattice stencil. ** A variation on smooth brick walls, if you want your brick to look like a very old broken down building, vary the thickness of your brick mixture as you spread it. Once you remove the lattice the remaining brick will look uneven like it is very old and some of it has worn away by age and weather. The brick on this house was applied more than 15 years ago and is good now as it was then. NEED INSTRUCTIONS for a Dollhouse Kit that came without them? From Laurie Sission: Some ideas on how to make Cruise Themed tables. 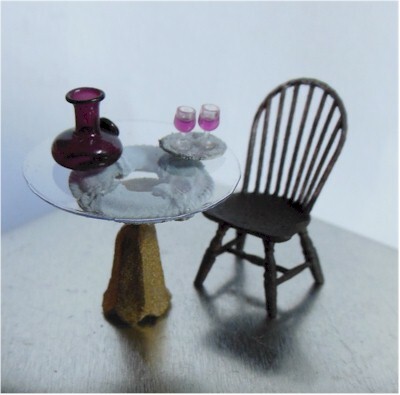 "It is the ships small wheel K-40XS on top of the Tulip Glass F-52. A quick spritz of Fusion Paint made a perfect primer. Then I used regular craft paint in brown, brushed with gold for the wheel. The base is all gold. The "glass" top is cut from a scrap of packing plastic. 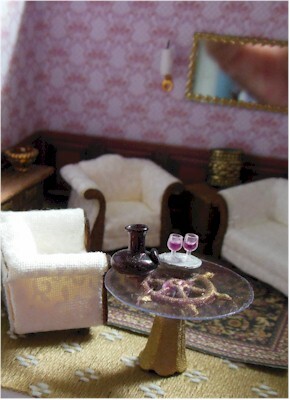 I am also using the shake glass F-53 as the base for the larger ships wheel to make a half inch side table. If you use the life preserver, they make nice tops as well. All sorts of Cruise Themed tables from these pieces. 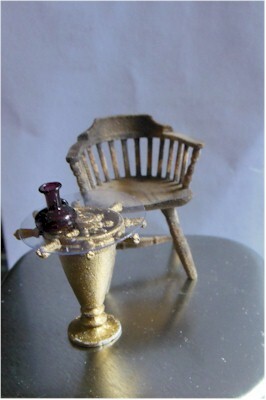 The shake glasses made sturdy bases used either way." NOTE: The ships wheels and life preservers also come in one inch scale too. You would need a larger base on them. scale quilts on a quilt rack to great affect. Probably should mention this on the half scale group - some might find it useful. Finally, a use for the scrubbys that come with our scrubby holders! Works perfectly for holding flower stems to dry with the leaves on them. soft. I usually wash them with Dawn detergent when done painting. thaw out, then wash out the soap. That should straighten it out. 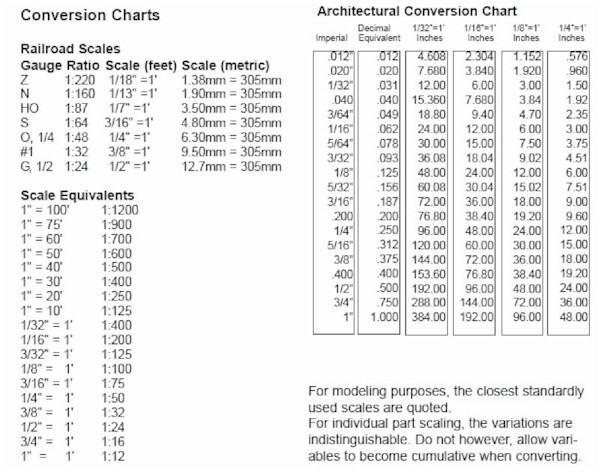 Some of you might find this conversion chart to be of some use.